Butler, my paternal grandmother’s line, presents research challenges, but when you find the people, they’re interesting! James Benjamin BUTLER (1880 – 1944) is my paternal grandmother’s father. He was tall, with blue eyes and sandy hair. Like most people in the rural south, James was a farmer. He later became Sheriff of Murray County, a dangerous job – he was shot by a “would-be prisoner” in November 1930. He and his wife, Maud, had ten children. David Sanford BUTLER (1855 – 1938) is James’ father. Dave’s mother (Rhoda Quarles) died when he was a baby and his father was what my dad would describe as a “rogue.” During his early childhood, Dave lived in the household of William T. Wofford, who was a Brigadier General in the Confederate Army. As far as I know, the Woffords are in no way related to the Butlers or Quarles’, so their reasons for taking in Dave are unclear at this time. In 1895, Dave was convicted of accessory to murder in a notorious whitecapping case. I’ll write that story another day. James B. BUTLER (1816 – 1876), the aforementioned rogue, deserves a post of his own. I’ve written a bit about him here. He fought in two wars, was a bigamist, and died in the State Lunatic Asylum at Milledgeville, Georgia. The line stops here. James had a sister named Susannah, who married a Sullins. She reports her own birthplace as Virginia on the 1850, 1870, and 1880 censuses, but as North Carolina on the 1860 census. In 1880, she says both parents were born in Virginia. A complete list of deceased Butlers in my genealogy database. Posts about Butler ancestors and relatives in this blog. 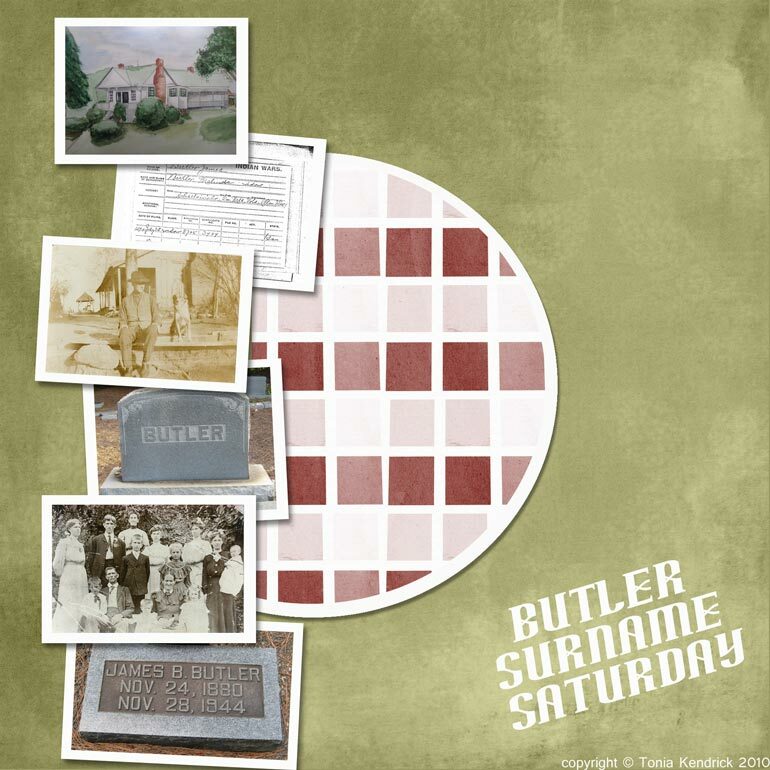 Butler documents, photos, and headstones. Locate J. B. and Maud on the 1910 census. Locate Dave on the 1860 census. Try to locate James Butler on the 1860 and 1870 censuses; given his lifestyle, he may not have been enumerated. Continue researching Susannah to try to locate the next generation. Research details on the whitecapping case. If you have additional information (or corrections) on the Butlers, comments are most appreciated!